Dr. William Collins received his doctorate in veterinary medicine from The Ohio State University and has served as a practicing veterinarian in Lincoln since 1986. Dr. Collins demonstrated his bent for his chosen profession in a series of progessively more responsible positions at a Lincoln Veterinary clinic during his undergraduate years at the University of Nebraska. He continues to demonstrate his concern for animals by taking a leadership role in the issue of pet overpopulation by pioneering early age spays and neuters in Lincoln and Lancaster County. Dr. Collins and Dr. Fry have been married since 1986. They enjoy spending time with their 2 daughters and their families, especially their grandson, Easton. In his spare time Dr. Collins enjoys gardening, travel, and golf. Dr. Lynn Fry has also been practicing since 1986. 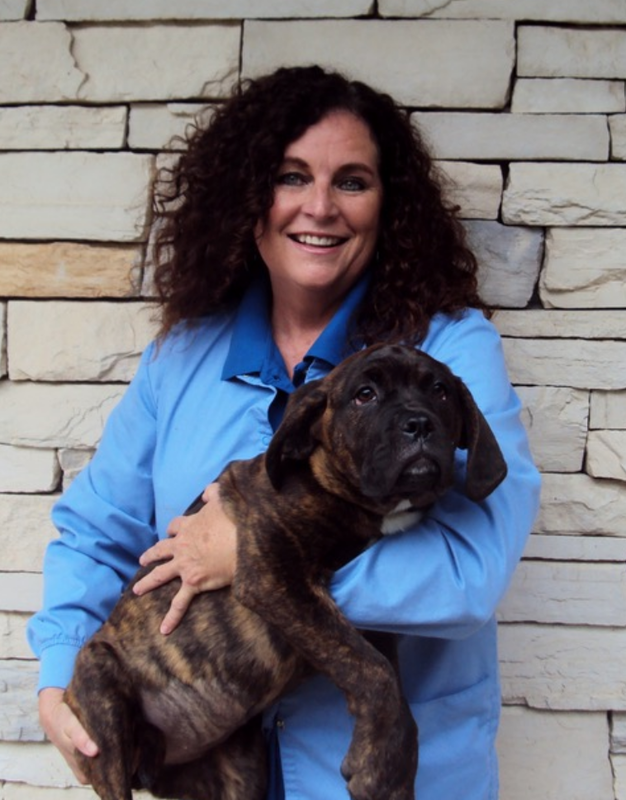 She began her career providing relief services at area veterinary clinics, while working at Capital Humane Society. A native of West Virginia, Dr. Fry graduated with a Bachelor’s Degree in biology from Concord University, Athens, WV and with a doctorate in veterinary medicine from The Ohio State University. Like other staff members, Dr. Fry’s love of animals, and deep-seeded desire to help pets and their owners share long, enjoyable relationships, has been a driving force in her career. Beyond her work at Antelope Creek Veterinary Healthcare Center, she served as a consulting veterinarian at Capital Humane Society for many years; caring for and meeting the needs of Lincoln’s less fortunate animals. Dr. Fry enjoys quilting, gardening and babysitting her grandson. In addition, she likes to throw a tennis ball for her and Dr. Collins’ Irish setter, Conor. Dr. Dane Terhune launched his veterinary career in Des Moines, Iowa after earning his Bachelor’s degree from The University of Nebraska at Lincoln and his Doctorate of Veterinary Medicine from Iowa State University in 1988. He returned to Lincoln, his home town, in 1990 to fill an associate position at a respected veterinary hospital. In early 1999, Dr. Terhune joined the professional team at Antelope Creek where he has continued his dedication to practicing high quality veterinary medicine and surgery. He endorses client education and preventive health care for our companion animals. Dr. Terhune enjoys attending and participating in sports and is involved in church and community outreach programs. Any other free time he spends with his family, friends and pets, but not necessarily in that order. Dr. Margarita Perez received her Bachelor of Science degree in biology from Nebraska Wesleyan University. In 2009, she graduated from Iowa State University with her Doctor of Veterinary Medicine degree. After taking care of her terminally ill mother, Dr. Perez started practicing emergency medicine and shelter medicine in 2011. Dr. Perez is interested in general medicine, palliative care and feline medicine. She is a member of the American Animal Hospital Association, the American Veterinary Medical Association, and the American Association of Feline Practitioners. Dr. Perez is married to her best friend, Hari, and they share their home with two black cats, a female named Nefertiti, and a male named Buckbeak (a.k.a. Dr. Buckbeak Jones). She enjoys spending time with her family, playing Words with Friends, and reading about the supreme court. Rochelle is our Patient Service Coordinator as well as a talented technician. She graduated from Colby Community College with an Associates degree and is a registered veterinary technician. She started her career with Antelope Creek in 1994. Rochelle’s husband Calvin works for the University of Nebraska and they have two children. Jessalyn is an agriculture education teacher in Oklahoma. Her son, Garrett, lives in Brookings, South Dakota where he works for 3M, Rochelle and Calvin also have a small herd of cattle that keep them busy! Kelley is originally from Marysville, Kansas. She has a bachelor’s degree from Kansas State University in Animal Science and an associate’s degree from Colby Community College in Veterinary Technology. She is a registered veterinary technician. Kelley has worked at Kansas State and Ohio State Universities in surgery and anesthesia as well as several specialty referral clinics and private practices. Kelley has 3 children; Dominic, Danielle and Nicole. She enjoys spending time at the lake on her stand up paddle board and going to the mountains every chance she gets. Kelley has a black lab named Jack and several barn kittens. Madisson graduated from Nebraska College of Technical Agriculture with an Associates of Applied Science in Veterinary Technology in May 2017. She worked in large animal medicine for almost 2 years before moving to Lincoln. She is originally from Hastings, Nebraska and is the oldest of 5 kids. She has a miniature Australian shepherd named Leia. Her hobbies include weight lifting, taking Leia for long walks, and hanging out with her friends. Jen received her Associates degree from Northeast Community College in Norfolk, Nebraska and became a veterinary assistant. She worked at a mixed animal practice for 2 years before joining Antelope Creek in 1998. Jen lives on a farm north of Ceresco, Nebraska where they also have a heating and air conditioning business. They have four sons, Monte, Ethan, Zach and Mason. In her spare time, Jen enjoys taking walks with her dog, camping and riding horses. Brandy grew up in Staplehurst, NE. She now lives in Lincoln with her two dogs Zelda and Roxy. Brandy has a strong passion for animals and loves working with them every day. In her free time, Brandy enjoys taking her dogs for walks, reading, bowling, and shooting. Megan is from Lincoln and graduated from Pius X High School in 2013. She is a Pre-Veterinary student at UNL and plans to graduate in 2017 with a Veterinary Science Major. Megan and her family have 5 dogs, 3 cats, and 5 chinchillas, Darrel, Dot, Dora, Dusty, and DJ. She likes to travel and spend time with family and friends, especially her new nephew, Kai. Mary is from Omaha, Nebraska and graduated from Skutt Catholic High School in 2015. She is a Pre-Veterinary student at the University of Nebraska-Lincoln and plans to graduate with a Veterinary Science Degree in 2019. Her family has a Siberian Husky x Australian Shepherd mix named Koda. She likes spending time with her family and friends. Jodi grew up and graduated highschool in Tecumseh, NE. She now lives in Lincoln with her husband, John, her 3 daughters Samantha, Santanna, and Skylar, and her 3 stepsons Nate, Nick. and Brandon. Jodi has been grooming animals for over 10 years, including her owner pets, a pomeranian named Sophie, a boxer-bulldog mix name Arowyn (A.K.A Wigglebutt), and a ragdoll cat named Frodo.